Most people who are aware of Louis Comfort Tiffany as a designer and creator of elegant Art Nouveau artifacts and, in particular, stained glass, are unaware that he started as a painter, training under George Inness and Samuel Coleman. The metropolitan Museum of Art in NY expanded the galleries in its American Wing to allow for more space devoted to Tiffany’s works, and has a nice online feature that includes some of his rarely noticed paintings and drawings, as well as work from other artists in the employ of Tiffany’s studio. 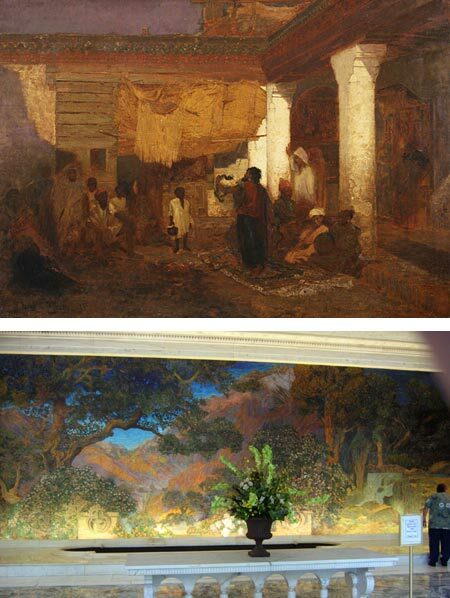 Included is Tiffany’s painting Snake Charmer at Tangier (image above, top, large version here). In the tradition of “Orientalist” painters like Jean-Léon Gérôme, Tiffany traveled to Egypt and North Africa and found inspiration in the exotic architecture, dress and customs. There also a selection of Tiffany paintings and drawings on the Art Renewal Center. From October 7, 207 to January 6, 2008 the Allentown Art Museum will feature Tiffany by Design, an exhibition of Tiffany’s famous lamps and other artifacts from the Neustadt Collection of Tiffany Glass in Long island City, NY. The Allentown Art Museum is concurrently showing Alphonse Mucha: Art Nouveau Extraordinaire (see my post on Mucha). My favorite piece by Tiffany is a collaboration with another artist, Maxfield Parrish, in which Tiffany interpreted Parrish’s painting for Dream Garden, a 15′ x 50′ (4.5m x 15m glass mosaic mural installed in the Curtis Center (formerly Curtis Publishing) here in Philadelphia. In city with its fair share of art scandal (Barnes, Eakins), this too was the center of controversy a few years ago when the new owners of the building saw it as stained glass dollar signs and wanted to dismantle it from the lobby of the historic building across from Independence Hall in which Tiffany and Parrish had installed it, and sell it to a collector from another city. Fortunately the city was able to prevent that; and I can say from a recent visit that it looks as glorious as ever (image, above, bottom; my photo in which I’ve left a visitor in for scale and couldn’t avoid the plant; there’s a better image here from Philadelphia Scenes by Dave Thomas). Initially I thought I would have to correct you when I saw the name and the Maxfield Parrish artwork. I missed that mural last time I was in Philadelphia but plan on it on the next visit. Great post, as always. The Curtis Center is at 6th and Walnut Sts., just across Walnut from Washington Square. The entrance to the lobby with the Tiffany/Parrish mural faces 6th St., across from the small park behind Independence Hall.